Aromatherapy For Acne - Treat Your Acne The Natural Way. Can you use aromatherapy for acne? Acne.......most of us have probably suffered from some degree of acne when we were younger. I was reasonably lucky in as much as I only had acne on my back. However, I was a swimmer as a teenager and so always in a swimsuit where my back was visible........as you can imagine I was quite self-conscious about it. So what exactly is acne? It is a common disorder of the skin and is usually found in the form of pimples, spots and blackheads - normally on the face and neck and/or on the back. It is generally caused by the over production of sebum, an oil which helps to protect the skin. Acne tends to be more common in teenagers because they are hormonal,(Mums and Dads, don't we know it!) and the oil glands in the skin become more active. Flaky skin, dried sebum and bacteria collect in the pores of the skin blocking them. This then prevents normal oil flow, so it is a bit of a vicious circle! For most people the main problem is a case of self-awareness and lack of confidence caused by pimples and spots, but in severe cases it can be very painful and ultimately cause scarring. How can aromatherapy for acne help? Aromatherapy for acne is one of the most effective natural treatments using essential oils with specific properties. Essential oils have many different therapeutic properties including anti-bacterial, antiseptic, anti-inflammatory, astringent and balancing and some are especially known to be good for acne skin-care. They heal and nourish the skin, are excellent cleansers and can help reduce inflammation. Combined with a carrier oilor natural gel and used directly on spots and pimples. The essential oils should not exceed a 2% dilution. In skin tonics and skin toners. Combined with facial clay to make a face mask. Which are the best essential oils to use? Tea tree is probably one of the best known essential oils fot treating acne, particularily for its antiseptic and anti-bacterial properties but also for its general healing nature. 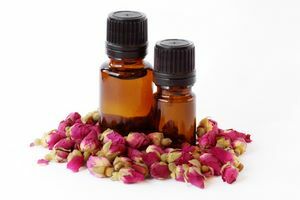 Other oils that are beneficial include: Benzoin, bergamot, eucalyptus, grapefruit, german chamomile, jasmine, lavender, lemon, lemongrass, patchouli, rosewood, sandalwood and ylang ylang. Jojoba oil is an especially great carrier oil to use because it is non-greasy, helps clean pores and is moisturising. Put the jojoba oil in a dark glass bottle and add the essential oils. Tightly close bottle and gently shake the bottle to mix the oils. Apply a small amount to the affected area twice a day. Please make sure that you avoid the eyes, nose and lips. Always gently shake bottle before each use. If you don't like the smell of tea tree then replace it with lemongrass. If you prefer a gel then try aloe vera gel in place of the jojoba oil. It may take some time before you see some results, but please be patient because natural aromatherapy for acne remedies DO work. Want to read more about tackling acne?